Another Brick in the Wall | Where's my backpack? Walk along 53rd Street in Manhattan going east, and you probably won’t even notice this remnant of the Cold War between 5th and Madison. 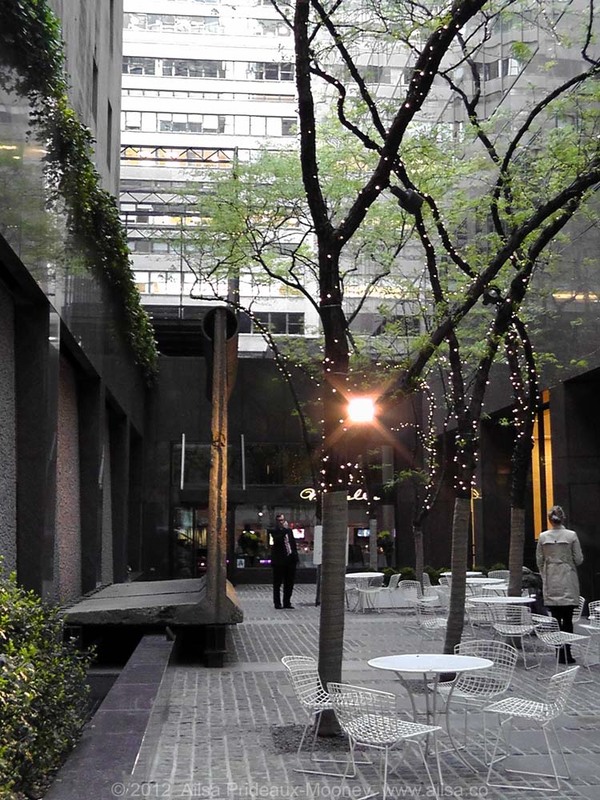 A cursory glance into the small plaza off to the left reveals nothing more than a thin slab of concrete. 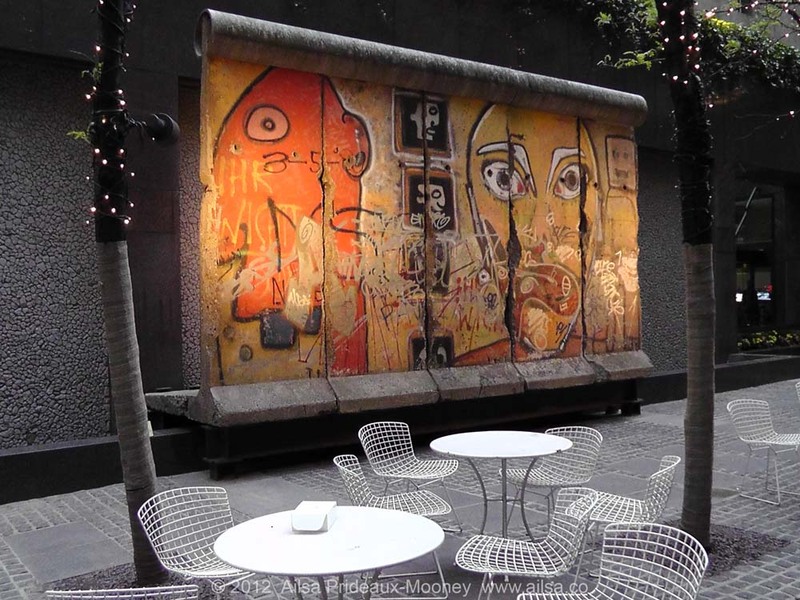 Coming from the other direction, however, you will spot five segments of the Berlin Wall serving as a backdrop to a seating area where New Yorkers relax over a cup of coffee. 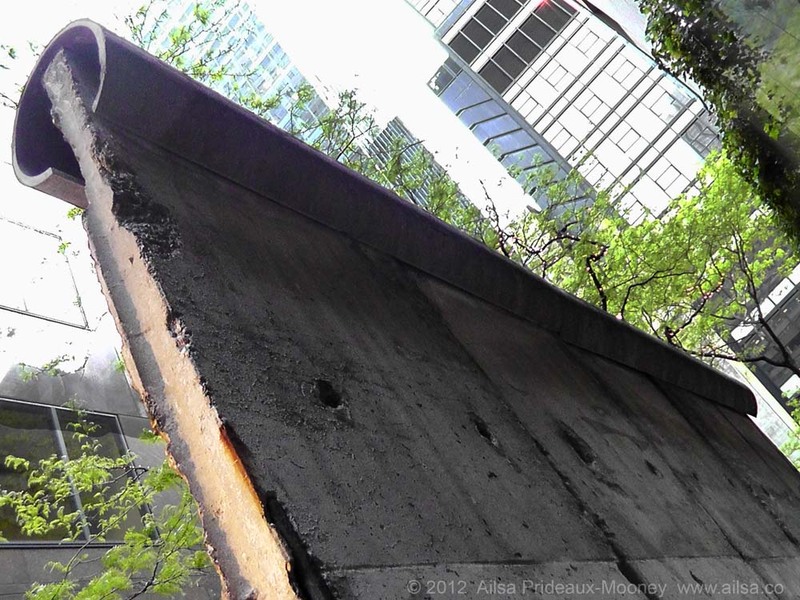 Jerry Spyer, the real estate mogul that owns the plaza, purchased it from the East German government and placed it here a year after the wall came down. 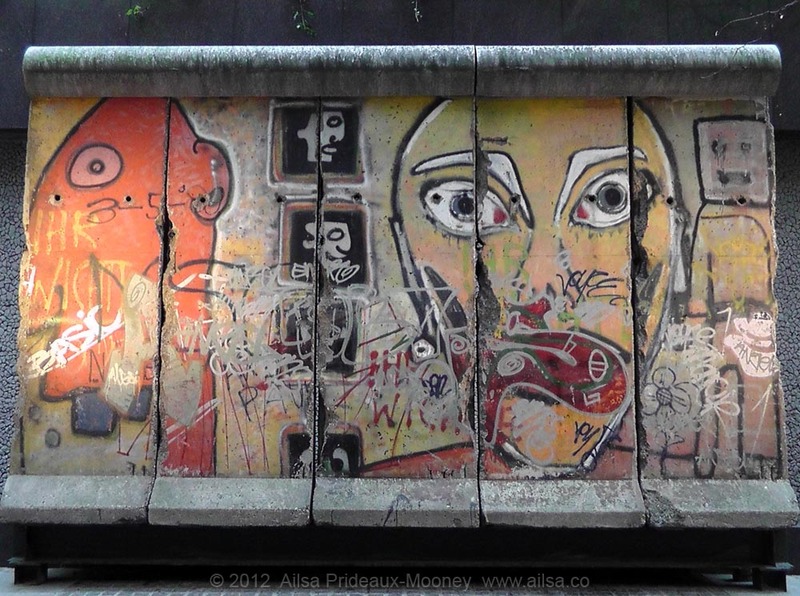 This particular part of the wall came from Waldemarstrasse in Kreuzberg, Berlin. The graffiti murals are the work of artists Thierry Noir and Kiddy Citny who, together with Christophe Bouchet in 1984, were the first people to dare deface the wall. Their aim was not to beautify it; rather they wanted to ridicule it and what it stood for. It was a hugely risky act of political protest, as the Berlin Wall was built a couple of metres inside the official border of East Germany and the East German soldiers could arrest anyone caught in the vicinity of the wall because they were trespassing on East German soil. These daring artists worked under cover of the night, always in groups, with at least one person keeping an eye out for soldiers. There were certain spots that were too dangerous to paint, particularly the covert concrete doorways that were hidden along the wall’s length. As the murals spread along the wall, so did public interest, and passers-by were often recruited to help out, under guidance from Noir, Bouchet, Citny and fellow artists. It’s all to easy to forget the extraordinary act of political revolt these murals represent, but if you take a moment to look behind the concrete structure in the heart of Manhattan, it will become all too clear, as the back of the wall is riddled with bullet holes. Bullets that were shot at people trying to escape. Bullets that killed people. This entry was posted in Germany, New York, Photography, Travel, United States and tagged history, photography, photos, pictures, postaday, travel, writing. Bookmark the permalink. I think it makes the artwork all the more impressive given the conditions under which it was created. Such intricate murals done on the run is quite an achievement. I doubt I could manage a stick figure! Thanks for bringing this little spot to light. – It could be overlooked. And certainly unknown if you aren’t from the area. These are such important pieces. Hopefully their significance won’t be lost as time goes by. Thanks susafras, glad you stopped by. You should see a movie called “The lives of others”. it’s about the life behind the wall. Excellent. Just looked it up on IMDB and see it’s got Sebastian Koch in it, brilliant actor, shall try to get my hands on it. Thanks for the suggestion! So true, byahengbarok. The placard next to this piece of the wall is so small it would easily be overlooked. I wonder how many people sit for their morning coffee there with no idea of its significance. It also makes me wonder how many things I walk by on a daily basis that I am oblivious to. …along with the Bertoia chairs which are popular classics over here – in Germany – as well. I like this place and what you made of it. Thanks tms, those chairs are pretty comfy too! Excellent, Logan, thanks for checking back in, heading over to check out your post now! I was living 45 min. From Metz , France. I was near Kaiserslautern . However my family is German and live in Berlin, hamburg, and by Nuremberg .thx for dropping by! Back at ya! It’s never too late! I know that park but haven’t seen the segment of the Berlin Wall. I’ll go see it soon. Great post. Great photos, Ailsa. Thanks for showing me this. I must visit it next time I’m in New York. Fantastic!! We will be traveling to Berlin in late summer so I was thrilled when I saw your piece. Now I am even more excited!